Each model in UGEARS collection is a fascinating item by itself. 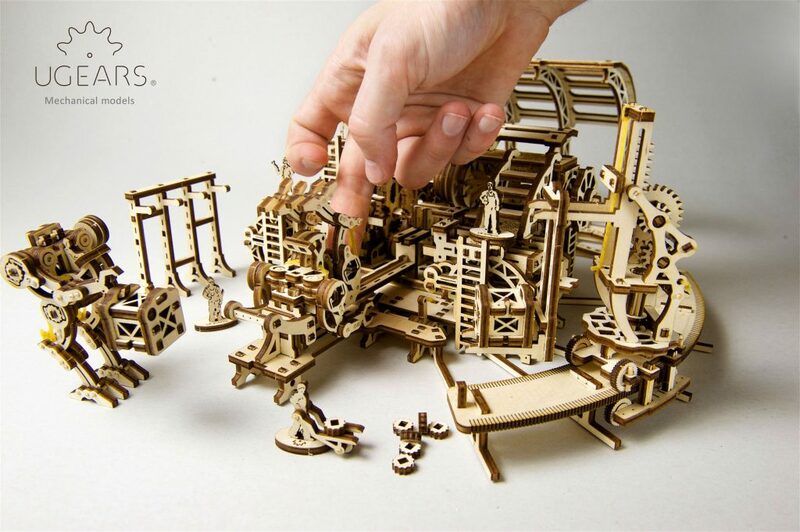 The assembly process, models’ resemblance to their real-life prototypes, their ability to produce motion without the use of electricity or any batteries, outstanding quality, and intricate design – all these make UGEARS models unique and one of a kind. With UGEARS 3-d models you have a unique opportunity to create a village or a small town. 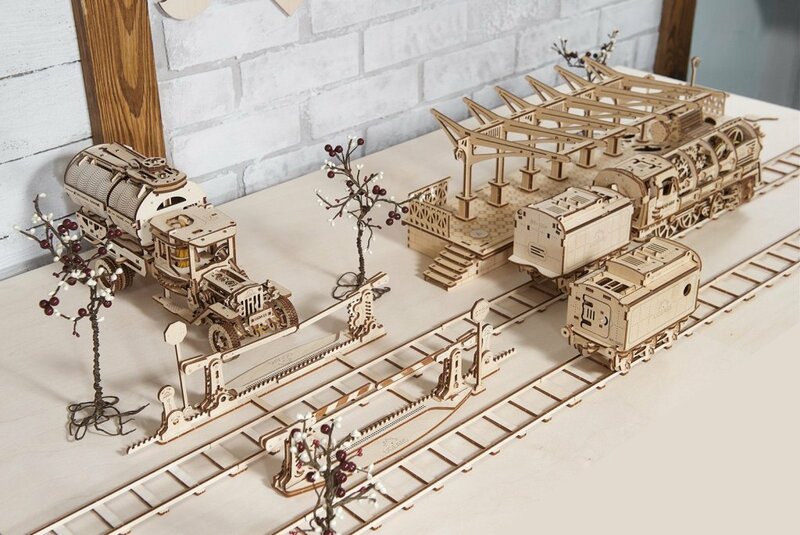 Each model, while functioning perfectly as a separate unit, can be assembled into the community and play an essential role as a part of the wooden mechanical habitat. So, which models can become fundamental start-ups for your new town? What creates the first impression for the tourists when they first enter a town? Correct. Its a point of entry: an airport or a seaport, a bus or a train station. 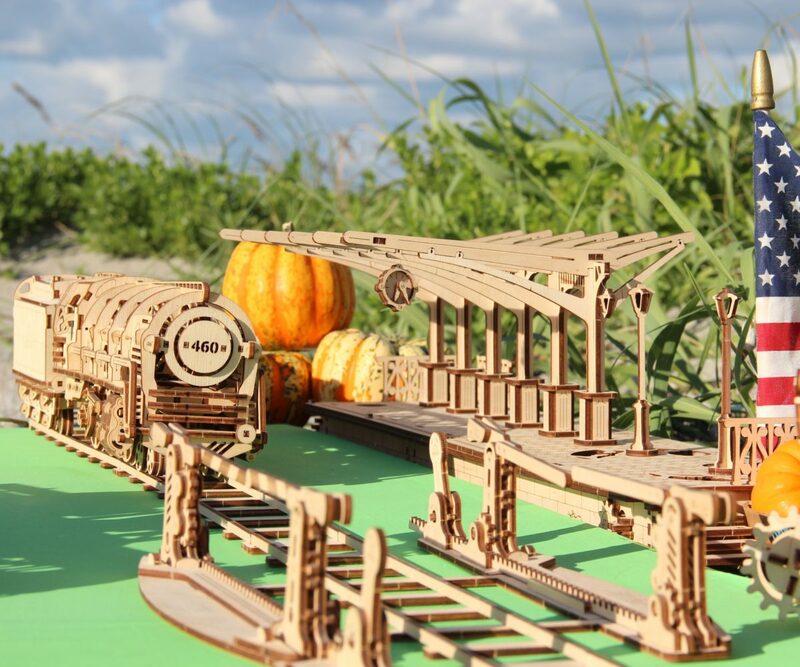 The UGEARS LOCOMOTIVE + RAILWAY PLATFORM + RAILS set can definitely make your new town first impression unforgettable. When assembled, this set becomes a railroad with a retro-style railway platform and a locomotive train. Set up a railroad crossing nearby for delivery truck’s easy access to the station. Speaking of delivery. Your heavy load shipments can be carried by UGEARS HEAVY BOY TRUCK VM-03 and its hefty addition, the UGEARS HEAVY BOY TRUCK VM-03 TRAILER. The smaller loads can be taken over by the UGEARS UGM-11 TRUCK AND SET OF ADDITIONS. This vintage truck model is set up with universal loading platform adapted for installation of the ascending Fire Ladder with the crane hook, the Tanker, and the Trailer Chassis, for loading and transporting various goods. Your new UGEARS community residents can benefit from stable employment, which can be provided by the UGEARS ROBOT FACTORY. This fully functioning industrial robotic production plant can become your town’s fundamental revenue generator. Last, but not least, organize your new community’s cultural center with UGEARS THEATRE. This miniature theatre model with intriguing moving characters inside is ideal for town residents to go to enjoy a play or a concert. 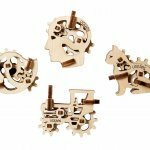 Whether you are working on a single UGEARS model or building an entire UGEARS community and bringing it to life, you, your family and friends are guaranteed hours of fun and exitement. This project will surely win your kids’ attention over from computer games, social media, and mobile devices and bring you closer together. All these and other UGEARS 3-d models can be ordered from our online catalog. 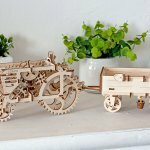 How does UGEARS TRACTOR AND TRAILER model work?